This article is about the goddess. For other uses, see Chang'e (disambiguation). Chang'e (Chinese: 嫦娥; pinyin: Cháng'é) or Chang-o, originally known as Heng'e,[note 1] is the Chinese goddess of the Moon. 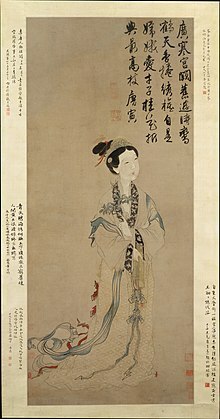 She is the subject of several legends in Chinese mythology, most of which incorporate several of the following elements: Houyi the archer, a benevolent or malevolent emperor, an elixir of life, and the Moon. She is married to the archer Houyi. In modern times, Chang'e has been the namesake of the Chinese Lunar Exploration Program. There are many tales about Chang'e, including a well-known story that is given as the origin of the Mid-Autumn Moon Festival. In a very distant past, ten suns had risen together into the skies and scorched the earth, thus causing hardship for the people. The archer Yi shot down nine of them, leaving just one sun, and was given the elixir of immortality as a reward. He did not consume it straight away, but let Chang'e keep it with her, as he did not want to gain immortality without his beloved wife Chang'e. However, while Yi went out hunting, his apprentice Fengmeng broke into his house and tried to force Chang'e to give him the elixir; she refused and to prevent him from getting it, drank it. Chang'e then flew upward toward the heavens, choosing the Moon as residence, as she loved her husband and hoped to live nearby him. Yi discovered what had transpired and felt sad, so he displayed the fruits and cakes that Chang'e had liked, and gave sacrifices to her. Chang'e appears in Wu Cheng'en's novel Journey to the West. The recently rediscovered divination text Guicang contains the story of Chang'e as a story providing the meaning to Hexagram 54 of the I Ching, "Returning Maiden". On Mid-Autumn Festival, the full Moon night of the eighth lunar month, an open-air altar is set up facing the Moon for the worship of Chang'e. New pastries are put on the altar for her to bless. She is said to endow her worshippers with beauty. Ronald Evans (CC): Among the large headlines concerning Apollo this morning, is one asking that you watch for a lovely girl with a big rabbit. An ancient legend says a beautiful Chinese girl called Chang-O has been living there for 4,000 years. It seems she was banished to the Moon because she stole the pill of immortality from her husband. You might also look for her companion, a large Chinese rabbit, who is easy to spot since he is always standing on his hind feet in the shade of a cinnamon tree. The name of the rabbit is not reported. In 2007, China launched its first lunar probe, a robotic spacecraft named Chang'e 1 in the goddess' honour. A second robotic probe, named Chang'e 2, was launched in 2010. A third Chang'e spacecraft, called Chang'e 3, landed on the Moon on 14 December 2013, making China the third country in the world to achieve such a feat after the former Soviet Union and the United States. The lander also delivered the robotic rover Yutu ("Jade Rabbit") to the lunar surface. On 3 January 2019, Chang'e 4 touched down on the far side of the Moon and deployed the Yutu-2 rover. ^ The name Heng'e was changed to Chang'e due to a taboo character from a name of Emperor Wen of Han. ^ a b c d e f g Yang & An 2005, 89-90 & 233. ^ Shaughnessy, Edward L. (2014). Unearthing the Changes: Recently Discovered Manuscripts of the Yi Jing ( I Ching) and Related Texts. New York: Columbia University Press. p. 154. ISBN 0231533306. ^ Clark, Stephen (1 October 2010). "China's second moon probe dispatched from Earth". Spaceflight Now. Retrieved 1 October 2010. ^ Rivers, Matt (January 3, 2019). "China lunar rover successfully touches down on far side of the moon, state media announces". CNN. Retrieved January 3, 2019. Yang, Lihui; An, Deming (2005). Handbook of Chinese mythology. Santa Barbara: ABC-Clio. ISBN 1-57607-806-X.